Jackie Ward is a graduate student at the University of California, San Diego (UCSD), and received a training grant from CIRM while studying for her PhD. At UCSD Jackie uses stem cells as a model to study rare neurodegenerative diseases in the lab of Albert La Spada. 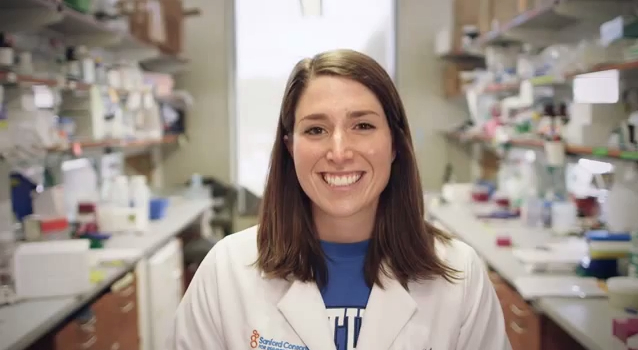 Her work as a PhD student focuses on a rare form of inherited neurodegeneration called spinocerebellar ataxia. From time to time Jackie shares her experiences with us. Here’s her latest. One of the many questions I get over my annual trek home during the holidays is “What…exactly…do you do?” This is usually couched somewhere between “have you learned to surf yet?” and “how’s the weather?” In the past, I preferred to talk about my surfing skills (very minimal) and the sunshine (always amazing, thanks San Diego), more than what I do every day. It’s amazing how this seemingly innocuous question can be the most difficult to answer. Because we’re used to presenting our work in lecture formats or lengthy scientific papers, summing it up in three sentences of non-jargon can be difficult. A similar thought was outlined recently at UCSD, by the actor and science advocate Alan Alda. The title of his presentation, “Getting the Public Past a Blind Date with Science,” highlighted the uncomfortable feelings many people have towards science. Like any relationship, sustained communication and trust is necessary for success. Unfortunately, on many scientific issues, that relationship has suffered. As a PhD student, I am constantly surrounded by my peers—other scientists who know exactly what I mean when I use terms like “reprogramming” or “retinal photoreceptor.” While these scientist-to-scientist conversations are vital to our work, we often forget that it is equally, or perhaps more, important to have conversations with people who have no idea what we do. As any CIRM- or NIH-funded lab is well aware, a significant portion of our funding comes from taxpayer dollars. It’s these “investors” to whom we ultimately report back. This conversation is challenging. Not only do we have to change our language, we have to remember what it was like to not know everything we do now. The best practice I’ve gotten in this regard is talking to kids. Seventh graders seem to be less afraid to ask you questions or call you out on something that doesn’t make sense to them. (Now that I think about it, it might be beneficial to include some 13-year-olds on our grant review panels.) My graduate program allows students to fulfill their teaching requirement by doing science outreach activities. I chose to do this with the Salk Institute’s mobile science lab, where real scientists are connected to local middle schools to discuss their jobs and lead hands-on science labs. I didn’t realize how valuable this experience was until it started to become easier for me to answer the “what do you do” question. I changed the words I use. I replaced the word “reprogram” with “rewind” and “retinal photoreceptor” with “eye cell.” Unexpectedly, I think this practice helped me become a better communicator when I talk to other scientists now too. I try not to assume a certain level of knowledge with anybody. While I still love talking about pretending to surf and gloating about the weather, I’ve become more fond of the “what do you do” question. I hope to only improve with time. It’ll be my small contribution for getting science to that second date. “This conversation is challenging. Not only do we have to change our language, we have to remember what it was like to not know everything we do now.” Wonderful insight!.